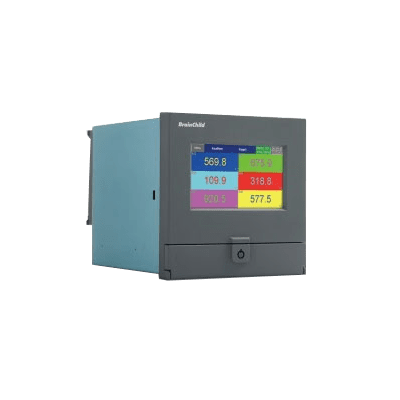 The PR10 Paperless Chart Recorder by Brainchild paperless chart recorder with a built-in high resolution 4.3″ touchscreen display, 6 channels, plug & play IO cards, and internal Flash memory storage. Its compact size makes it a portable solution for laboratories, factories and classrooms alike. 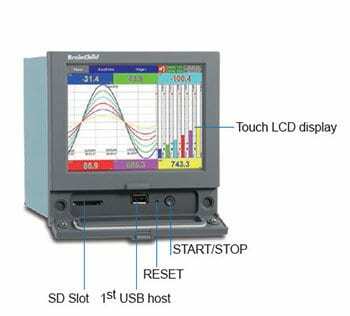 Users can access onsite data either on the screen data or from a remote location via RS-232/RS-485/RS-422 serial interfaces or via Ethernet networking. The Brainchild PR10 includes standard configuration software featuring a historical viewer. Configuration can be done on a PC and then sent to the recorder. Historical data can be stored in flash ROM, Compact Flash Card, or on a remote host PC for data evaluation and print-out. The PR10 comes with standard software for configuration and a historical viewer. Configuration can be done on a PC and then sent to the recorder.